Discover where cubism, collage and portraiture collide to become expressive works of art! Kids and families are invited to join us this weekend for hands-on workshops with photographer Kyra Kelpin. My Space as Self-Portrait Collage is a creative photo collage workshop taps into a child's ideas around identity, play and regional environment. Using oneself as a subject and manipulating or reproducing our own image has long been a way that artists explore who we are and where we fit in. This workshop starts with portraiture and finishes with students exploring their image and local environment. 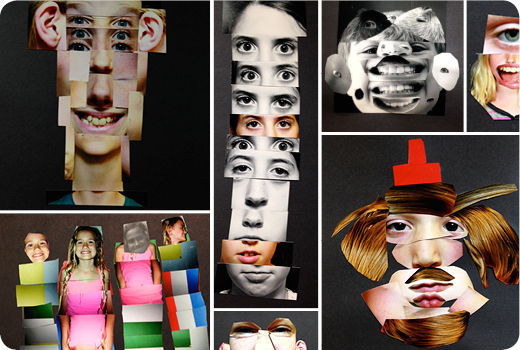 Through a hands-on cut-and-paste method, students will build a self-portrait that represents for them their personality and the elements that they value around themselves. Admission is free. No registration necessary, but do come early as this is a popular program. Each 45-minute workshop takes place twice, at 11am and 1pm. This workshop is recommended for ages 5 and up, but all are welcome!